Adjuvants are too often an afterthought. The products we use — surfactants, oils, fertilizers, stickers, drift retardants — haven’t changed much over the years, but there are new things to consider each year with the introduction of new herbicides and new weed-control issues. I asked Richard Zollinger, weed scientist at North Dakota State University, to give me the latest on the topic. He explained that adjuvants, which enhance the efficacy of other products, have different modes of action. “Some adjuvants, like NIS (nonionic surfactants), are for product retention; NIS and oils (crop oil concentrate (COC) and methylated seed oil (MSO)) help with deposition; and oils and ammonium sulfate help with absorption. NIS (products) breaks the surface tension of water so it flattens out and spreads across the leaf, while oils help improve leaf penetration, and these are the two most important adjuvants to pay attention to this year,” Zollinger said. All adjuvants are not created equal. Zollinger said that adjuvants aren’t all the same and can contain different ingredients in different amounts. That means growers need to know what they are buying and make sure they are getting enough product into their spray solution. “Adjuvants aren’t regulated products like pesticides. A product can carry the same name, but the ingredients can change or the amount of ingredients can change, so be aware,” he said. AMS (ammonium sulfate) fertilizer is a utility adjuvant that is used to tie up the minerals present in hard water and keep the molecules of active ingredients available. 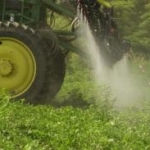 When spraying glyphosate, most farmers add 8.5 to 17 pounds of AMS per 100 gallons of spray solution — and usually add on the higher side to be sure. That is a lot of bags of AMS to add in a 1,000 gallon spray tank over the season, so liquid AMS products are generally considered more convenient to use. Zollinger said 8.5 pounds of AMS is sufficient for most water sources. However, the only way to know for sure is to have the water tested to get the correct rate. 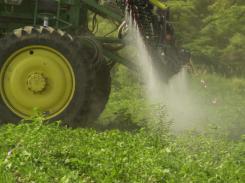 The need for a water conditioner is based on the water quality used for pesticide application. That is why getting your water source tested to know the hardness and the antagonistic ions in the water is important. From the water analysis, a grower can then determine how much AMS or water conditioners are needed to prevent the antagonism. One of the largest areas for growth in herbicide adjuvants over the past several years has been the High Surfactant Oil Concentrate (HSOC) category of adjuvants. These products are composed of both oil and surfactant chemistry with the intent of honing performance to suit herbicides or herbicide combinations that may benefit from both NIS and (COC) or MSO adjuvant products. In some cases, these products are marketed as potential replacements for COC or MSO products. HSOC comes either with petroleum-based oil or an MSO concentrate . MSO is always a more active adjuvant than petroleum oil. A methylated crop oil acts just like a crop oil concentrate. Zollinger said that HSOC becomes important when tank mixing glyphosate with an oil-based herbicide partner. “Glyphosate is water soluble and requires a surfactant. Most tank mix partners are lipophilic (oil-loving), and when mixed together in water, they are not compatible. Adding an HSOC helps the glyphosate and tank mix partner with the MSO component,” he said. — Stay with major branded adjuvants. “Be careful of off-branded and new products — they have to be tested against the most reliable branded products,” he said. — Do not cut back on recommended rates; it may work sometimes, but in the long run it is not worth it. “Cutting back adjuvant rate is probably the biggest weed-control issue today,” he said. — If tank-mixing a post herbicide with glyphosate, make sure you add HSOC. — If using a MSO, stay with 1.5 pints per acre and do not use the volume-per-volume approach. “When applying in low volumes, not enough MSO will be applied and performance will go down,” Zollinger said.